Strong notes of citrus and pine rush out of the glass and into your palate with this IPA. The odor is skunky and reminiscent of marijuana, fitting with its west coast origin. The amber color is quite pleasant and it pours with a thin but dense head to match. 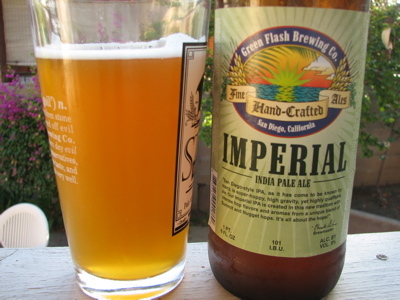 Green Flash is a great brewing company and you can be sure to see more of them down the road, but this may be the best. They mix it up with premium Summit and Nugget hops which produces a extremely flavorful and heady IPA that is still light and quaffable. The intense fruity aromas and flavors dominate the sensory experience of this beer and at 9.8% ABV maybe it’s best that you enjoy it slowly and savor it. High Gravity. High Hops. High quality.